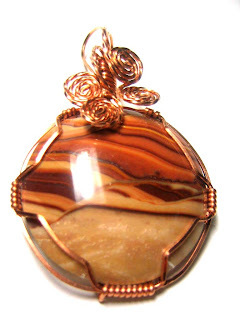 These two picture jasper cabochons were made by and given to me by my friend and mentor Linda. Linda lives in CA and got me started in jewelry making. I've had so much fun and have met so many great people since I started making jewelry. So much thanks for everything, Linda! I wrapped the two cabs with square copper wire and half round copper wire. Here we are! Two friends and me on dress-up night on the cruise. We had a real nice time. As I said earlier I didn't take to wire wrapping right off the bat. I think the thought of having to buy all that sterling silver and gold-filled wire turned me off. I've since discovered that I don't have to use those wires. Almost any soft wire gives me the results that I want! Of course taking the classes from Eni Oken on the cruise last week really got my enthusiasm up! I am humbled by her expertise! I bought all her tutorials on a cd and I've been trying them out. 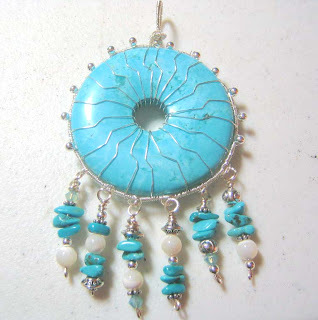 Today I made use of the turquoise donut that I bought at Wm Holland school last year. This is the picture of it. It took me about 3 hours while watching TV. It is Eni's design. Her tutorials are easy to read and follow. That CD was such a good investment! Today I finished up some of the aquamarines that I got at Ocean View mine. I'm in the process of wrapping one of them. My cabbing class is finished. I think I want to repeat it in the fall. Hannah is such a great teacher and I learned so much from her and I know if I take it again I'll learn that much more. I also had a couple of very nice ladies come to my home, today, with some beautiful cabs that they made at the St. Lucie Co. Rock & Gem Club's open workshop. They want me to wire wrap them! I'm so flattered. We seem to agree on less is more and I can't wait to start wrapping them! Tomorrow is another class. 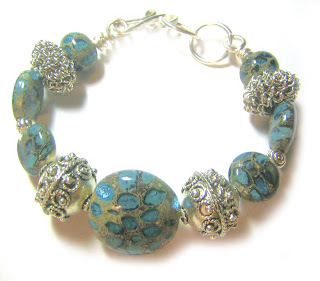 The beautiful Victorian Garden is the project at Beads & Baubles in Fort Pierce. 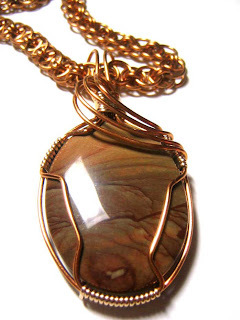 I learned wire wrapping up in William Holland Lapidary Arts School in Young Harris, GA in Sept of 2006. When I first started ww I wasn't too sure that I liked it. I had a great teacher but I left thinking that I wouldn't be doing too much of that! I did pieces off and on for the past 1 1/2 years but it wasn't until the past month that I've gotten into it full force. I have collected so many cabs and I have been making some of my own cabs that I have had a lot to choose from. My one big draw back was the wire. Sterling silver is so expensive. I try to keep some sterling in stock but it's usually round for making jump rings. I didn't want to go to the expense of buying the square and half round wire needed for wrapping! Finally I decided to try it with the round wire. I used my favorite wire Para Wire and started wrapping using a smaller gauge for the actual wrap. They turned out great! So I kept going. I'm not fond of all the "frou, frous" at the top. I'm more the tailored person. 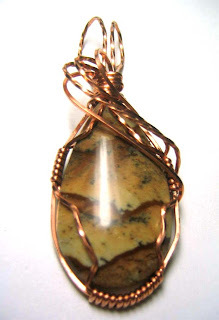 The picture shows a picture jasper cab I came up with last week and I'm really happy with it! Now back to work to make more! I have been a real slacker where my blog is concerned! Being home has been good for me. Of course I don't stay put for very long! I left on a cruise 3/1 and I just got home. It was so much fun! I was a cruise virgin and I certainly did enjoy my first cruise. I went with a group of beaders. We took classes while at sea. My classes were taught by Eni Oken, a world renowned wire worker and Marsha DeCoster also world renowned in the beading world. I've come back so much more knowledgeable! Aside from the great classes I have to say that everyone of the people that I met during the cruise was a pleasure. 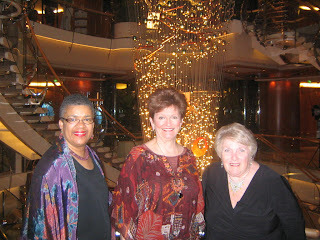 From my fellow beaders to the ship's staff to the people in Jamaica they were all interesting, polite and fun. Our waiter, "Ping", had us in stitches every night. He was so entertaining. It seems he is from Thailand. He works for six months at a time and has two months off. Whew, what a schedule! He has a wife and two children that must miss him a lot. A comment on the picture. I made this bracelet tonight. I used beads made by my NY friend Lea Avroch. They are so beautiful. The color is a deep teal with flecks of silver. The beads have such depth and shine that I sit mesemerized stareing at them! they kind of remind me of the water's of the Carribiean. I keep thinking and going back to the cruise in my mind. My body even seems like it is still on the ship! I will try to be better and post here more often!